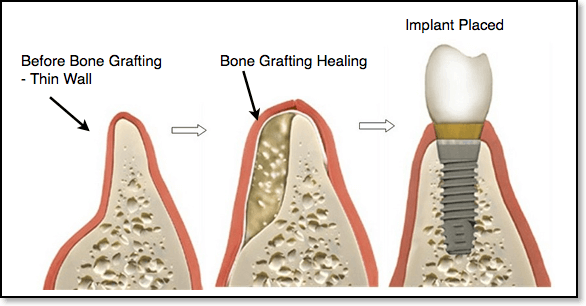 Bone grafting is required if your jawbone isn’t thick enough or is too soft to continue with dental implant surgery. This is because the chewing action of the mouth is extremely powerful and exerts great pressure on the jawbone. Without enough support from the bone, the dental implant would fail. A bone graft, then, can create a more solid base for the implant to succeed. In bone grafting, allograft bone graft is placed in the area where the bone is weak and it is then fused to the existing bone. It may take many months for the transplanted bone to grow and heal enough to support a dental implant. A successful bone graft allows your jaw bone to be strong enough to support your dental implant. During the surgery, Dr. Khan will numb the grafting and extraction sites using local anesthetic. A small incision will be made to prepare the site for the new bone and it will be anchored into place. The surgery does not require an overnight stay, and you will be provided with comprehensive instructions for your post-operative care. Dr. Khan will prescribe medications to help manage infection, discomfort and swelling.